A collision or sideswipe by a semi truck or tractor trailer can happen with devastating force. 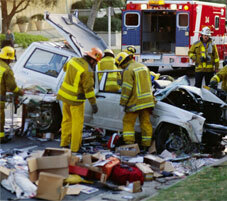 The result can be serious injuries and loss of life. Victims of truck accidents and their families are entitled to claim compensation for their injuries, financial losses and suffering, but obtaining what they deserve can be difficult. Radloff & Radloff, P.A. stands up for victims of truck accidents. We work to obtain the financial resources that can provide medical treatment, long-term care and peace of mind for our clients. Call us at 866.451.3211 to arrange for a free consultation. An attorney at our firm can discuss your case and how we may be able to obtain the compensation you need to rebuild your life. Because we emphasize personalized service, you will deal with our attorneys directly. At Radloff & Radloff, P.A., our lawyers have successfully represented clients in numerous cases involving truck accidents, car accidents, motorcycle accidents and other acts of negligence. Using our knowledge and experience and collaborating with investigators, highway safety experts and other professionals, we will work to build a strong and solid case on your behalf. We will also work with your doctor to identify the treatment and care you need to make as full a recovery as possible. If you do not have access to medical treatment, we can direct you to a sympathetic and experienced doctor who can provide care while we work on your case. Fortunately for victims of truck accidents, there are many sources of information that can help the case. Federal regulations require over-the-road truckers to maintain driver logs, truck maintenance records and other valuable information. In addition, many trucks these days carry black boxes that can prove helpful in determining the cause of the accident. Radloff & Radloff, P.A. uses this data and other information to build your case for compensation. You must act quickly. Important evidence can begin to disappear with every passing hour. To preserve your ability to claim compensation, you should talk with an experienced personal injury lawyer as soon as possible. Radloff & Radloff, P.A. will go to work immediately to begin building your case. We want to help you in your time of need! For a free initial consultation with Radloff & Radloff, P.A., call 904.398.2200 or toll-free at 866.451.3211 or send us an e-mail. We represent clients in the Jacksonville area and Northeast Florida.